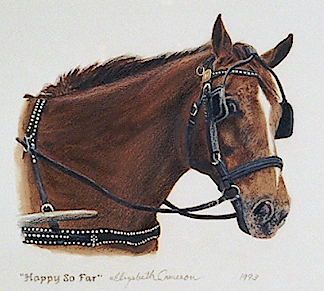 the Artist, Elizabeth Cameron. All work is copyrighted. over the years, and I'd love to do more! 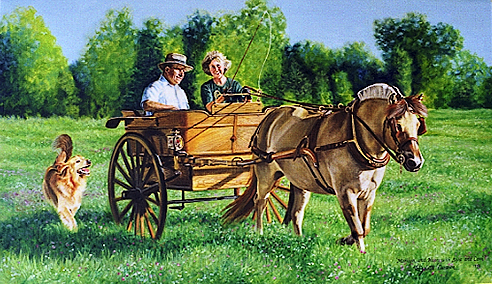 Marilyn & Harry are in a restored antique tub cart. and indeed, they are as happy as they look in the painting. 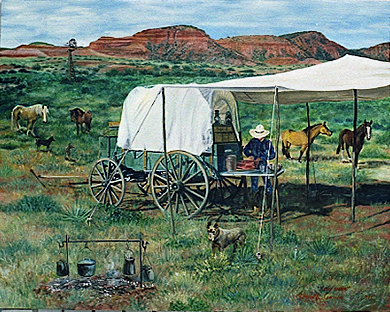 have the original oil in their kitchen. Here are the photos I worked from. Coni and us from the day we picked it up. a treasure to last our life time and beyond. looking forward to our 50th anniversary next year. Libby did a painting of our Liza that is just as delightful. "Sven & Pilgrim with Timmy & Hundi"
the tackroom was locked one day! and is a well known Midwestern whip. This was done from the only photo his heartbroken owners had. phase of the Villa Louis Carriage Classic in Prairie Du Chien, Wisconsin. I often helped groom with the team so I painted a self-portrait at far right! the carriage! He had amazing nerve and skill. 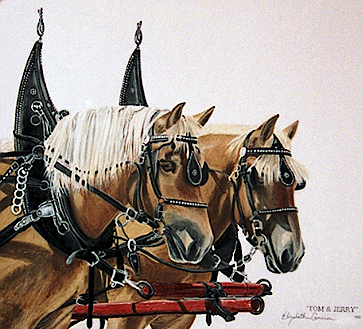 Warmbloods hitched Hungarian style to a Hungarian shooting break. entitled it "Raising Dust." Please email me for availability. I got my Meadowbrook from Kathy Christenson. included all her past and present horses and dogs! together from the many photos she sent me. 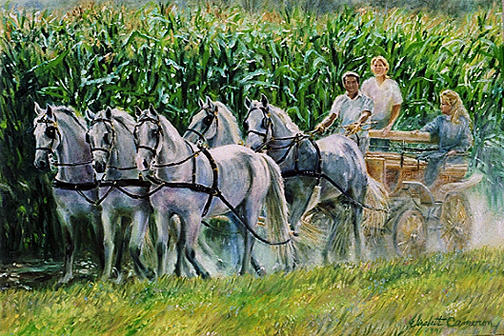 "Donna Zimmerman & Petal Brook Odyssey"
"PB" was Donna's beloved Morgan stallion of many years. showing many aspects of their happy moments together in a time line collage. This was a surprise for my neighbor's husband. 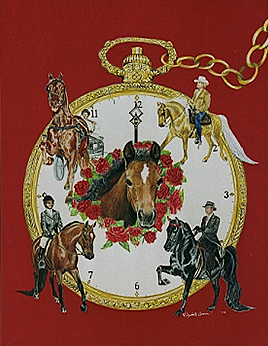 "Morgan Grand National Program Cover"
available through the National Museum of the Morgan Horse. 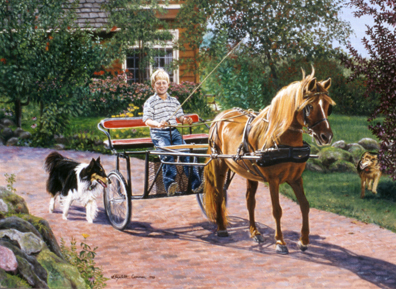 My models included my niece, and the sire of my mare. fireworks at the grand finale in the arena! It is fun to have my work used on programs and publications. custom painting can be done! about their loved ones like you do? Please let them know how I can be of service. Your referrals are my best compliment! ...Continuing The Paintings From 2006! Page 11. - Dogs, Dogs & More Dogs! Page 12. - Never Too Many Dogs! Page 13. - Dogarama Spectacular!